Pictured from left to right, Westman Youth Football Association President Brady Dane, Bev Neufeld of the Ashley Neufeld Softball Complex and Noel Harding of the Brandon Boxing Club stand alongside BIRT Cup committee member Tyler Crayston and Investors Group representatives Tim Rowan and Dennis Hunt for a cheque presentation at Brandon University's Healthy Living Centre. 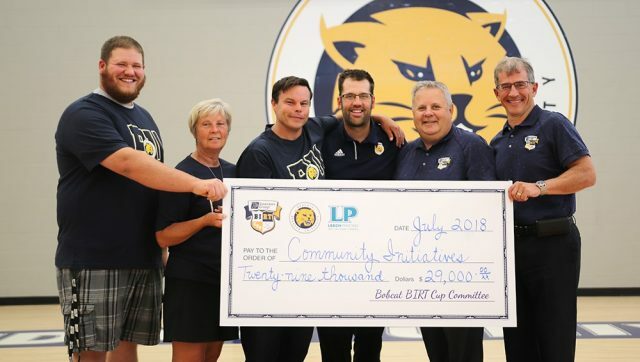 BRANDON – The first installment of the Investors Group BIRT Cup under the Brandon University (BU) Bobcats’ banner was a success. The alumni/charity tournament at the Wheat City Golf Course on Friday, July 13 raised $29,000 for several sports-related community initiatives. The funding will go towards the Boyd Stadium football fields project, the Brandon Boxing Club, the Ashley Neufeld Softball Complex and a newly established scholarship award for Brandon University student-athletes. Brandon University Athletics took over the tournament from Bobcat hockey alum Scott Hlady, who ran the BIRT Cup independently for 10 years. Hlady and his foursome of Dwayne Gylywoychuk, David Anning and Jody Norminton captured the 2018 championship on a count back after finishing in a three-way tie for top spot at 14-under. “Winning the prestigious trophy and passing the BIRT Cup torch onto the Bobcats was a special moment,” said Hlady. The business community extended a huge helping hand to the Bobcats with 70 sponsors supporting the tournament. A number of pro athletes also donated autographed items that were put towards a raffle fundraiser. Bobcat Sports Wall of Famer Mike McEwen, Canadian Football League player Landon Rice, Matt Calvert of the National Hockey League’s (NHL’s) Colorado Avalanche, St. Louis Blues NHL defenceman Joel Edmundson and Stanley Cup champion Devante Smith-Pelly of the NHL’s Washington Capitals made contributions. Brandon University hockey alumnus Kit Harrison won the raffle’s grand prize — a Vegas Golden Knights’ Travel Package. Harrison’s trip includes flight, hotel and two tickets to watch the Knights face the visiting Winnipeg Jets on Feb. 22, 2019.